Slot machines are the most popular game in casinos. Slots take up the largest amount of floor space, and they’re responsible for the vast majority of gambling profit. They come in many different shapes, sizes, and varieties. From the classic mechanical one-armed bandits of frontier casinos to the most modern online video bonus game, slots have been popular for over a hundred years and continue to be a source of cheap entertainment. Stick with progressive slot machines. Your only real chance of winning a million dollars is to hit it big with a single jackpot, and a seven figure jackpot is only available on the progressive games, like Megabucks. Know the odds. This won’t actually help you win, but you’ll feel a lot better about losing when you understand that the chances of winning that large an amount are about 1 in 50 million. Consider the lottery, too. The odds of winning more than a million dollars are twice as good playing the lottery, but it’s not nearly as much fun as playing on gambling machines in a casino. Focus on having fun. Since the odds of winning are so low, you need to find at least one secondary reason for playing in the first place. Having fun is a great reason! Understand the difference between playing a slot machine game and the lottery. When you play s lot machine game, you might be making as many as 300 or 500 bets per hour. At $3 a spin, that’s between $900 and $1500 that you’re wagering. Who buys $1500 worth of lottery tickets at a time? It’s an entirely different mindset. casinos.) The jackpot was $1,700,000+ last time we checked. Slot machines used to be mechanical devices that worked by paying out when the machine’s interior parts lined up a certain way, as displayed on the front of the machine using different symbols. Today’s slots are run using random number generators and electronic parts that are programmed to pay out a certain percentage of the money put into them. The three most common varieties of slot machines are classic games, video slot games, and progressive machines. The closest thing to slots as they existed when first invented in the 19th century, classic slots use three spinning reels and one single pay line to determine if you’re a winner or not. Some people prefer the simpler style of play offered by classic slots, and these three-reel games usually allow for smaller bets than more modern games. Sometimes called video bonus games, these machines have all the bells and whistles that modern game designers can throw at customers. Video slots include high-quality video clips with lots of sound effects and animations to give the player a more interactive experience. Often, these titles have bonus games built around the video scenes that offer the player a chance to win free spins, bonus cash, and other prizes. When casinos link a group of slots together with a top prize that gets progressively bigger the more money people put into it, these machines are known as progressive slots. These big payouts work by taking a small percentage of each wager put into the network of progressive slots and paying the prize out to the lucky player who can line up the right combination. While knowing a little bit about the history of slot machines is not really important if all you care about is finding a great machine to play today, it is kind of interesting to some people, myself included. Charles Fey is credited with the invention and manufacture of the very first slot machine in the late 1800’s. It is interesting to note that while Fey’s machine was invented on the west coast, there was another machine developed on the east coast, also in the late 1800’s, by Pitt and Sittman. The Fey machine was called a liberty bell because one of the symbols, along with diamonds, horseshoes, hearts and spades, was a liberty bell. By today’s standards these early machines were quite crude. But much like today, they were wildly popular. Bonus Round – Many versions of the current video based machines have special in-game bonus rounds that are unlocked by hitting special combinations. These special rounds vary a great deal by game, but in almost every case when you are lucky enough to open one you are in for a nice win. More information about slots safety at legitimatecasino.com. Flashing Candle – This is the light on the top of some machines. It was more prevalent before everything went to a ticket system which is found in most modern casinos now. The candle would flash alerting the casino that the machine needed a slot attendants attention. This could be from a malfunction or a hand pay or a needed fill. Carousel or Island – A group or collection of slot machines together in a circle or grouped back-to-back in a formation. Usually they are connected by the same theme or sometimes they share a common jackpot. Credit Meter – Most new machines accept bills or tickets and then print out your balance when you leave on a ticket. The ticket can be used at another machine or may be cashed in at the cashier window. The credit meter is usually displayed on an LED screen on the machine, showing your current balance. Hopper – The tray toward the bottom of the game where coins come out when you win. These are becoming rarer and rarer as the industry moves to a ticket system. Lever or Handle – The handle on the side of old machines that you pulled on to start the reels after you had put your money in. Many newer machines still have levers, but you don’t have to use them. Payline or Pay Line – The line, or one of the many lines, that you are hoping to line up a correct line of symbols to win a prize. The first line is the one that is straight across the middle of the game from left to right. This may be the only pay ling on some machines, but many of the video slots games have multiple pay lines. For example you may see an advertisement that states a machine has 20 paylines. Remember though that you have to activate each line by making a wager. Pay Table – The pay table is the screen or plaque attached to the game that show the payouts for each combination. For example, three apples in a row may pay $25 while 3 bars in a row may pay a free spin. RNG or Random Number Generator – This is the term usually used for the computer that determines the final display of the reels and symbols on a machine after each spin. Though it is a little more complicated than this, here is a basic example to help you understand how a RNG works. Each possible outcome is assigned a number. Lets say there are 100 possible outcomes. So each of the possible outcomes is assigned a number from 0 to 99. (It could be from 1 to 100, but in truth if there were 100 it would start with 0. If it helps you can count the 0 as 100 instead in your mind.) The random number generator will randomly pick one of the 100 numbers on each spin. So if three cherries was assigned to the number 5 then any time the RNG picked five the 3 cherries would display on the screen. Any trusted brand will have certified RNGs. needed to offer the payouts they want to players while keeping the profit margins that the casinos want. machines sometimes use pictures of famous props from the movie as symbols. with people trying to cheat. However, if a new machine malfunctions, it is still usually referred to as a tilt. No matter if you’re playing in a land-based casino or online, the brain of a slot machine is called a random number generator. Every action of the machine is controlled by this device that constantly spits out a series of random numbers. Clicking the SPIN button on a modern slot causes the machine to capture a certain random number, and that number is translated into a win or a loss. The symbols, video scenes, bonus rounds, and other features of modern slots are just there for entertainment; slot machines are really just random number generators with an interface to keep things interesting. If you understand that slot machines work using random number generators, you can avoid a lot of the typical pitfalls of the slot gambler – machines aren’t hot or cold, they aren’t designed to rip off customers, and just because a machine hasn’t paid off in a while doesn’t mean it is somehow due to dispense a jackpot. Slots are profitable because they’re programmed to pay back to players a smaller amount of cash than is paid into them, which gives the casino its edge. 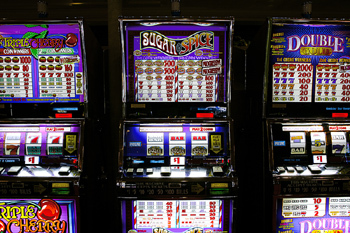 Slot machines always win over time, thanks to the way they’re programmed. The trick is to find a machine that’s entertaining and fits your budget. The rest is up to random numbers and Lady Luck. Machines used to use actual reels inside that spun. The payouts were based on the mathematics of the probability of each combination lining up. The problem with this system was the reels could only get so big. So even if you see a current slot that has reels, it is still controlled by a RNG. These machines are also known by other names depending on where you are in the world. For example, here are some alternative names. Slot machine makers is a guide to slots games and slot machines, organized by the companies who make and/or manufacture those games. In the right menu, you’ll find listings for the most popular companies in the industry, and each of those pages links to additional pages describing and explaining the specifics for each game.